I think the first is some kind of daffodil, but tiny and fancy and fragrant. And I think the second is an allium. I wish I still had the packing slip from the big mess of bulbs I bought last fall. We have a three ring binder and we staple the plant info into it after planting. We also take photos of the yard at various times of the year and put that in the binder too, so we can see how those seeds and plants have grown, when they blossom, etc. The first is definitely a daffodil of some sort. I have similar ones in my garden, though they don't bloom very well. The traditional ones bloom fine. Not sure about the second. If you post again when it blooms, and I may know. I have to place markers so that I don't accidentally pull something up thinking it's a weed. I did that last year. purdy! the only good thing about spring. because i hate all the rain. 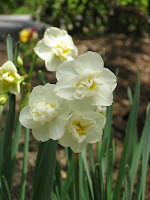 I have the same variety of daff in my garden and it has also stopped blooming well--I think it just needs dividing. 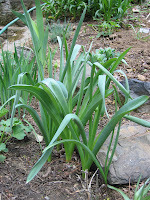 My alliums have mostly not come back this year--and last year was their first!